Your first steps when a loved one dies depend on the circumstances of the death. If you need help, our specially trained answering service at (425) 316-8290 can address your questions 24/7. How did your loved one pass? Expected death at a facility (hospital, nursing home) - Let the nurse or staff know that you are choosing A Sacred Moment as your funeral service provider, and give them our phone number. A staff person will make the initial call. Expected death at home with hospice - The hospice nurse will notify the medical examiner/coroner and alert A Sacred Moment. You can then choose to keep the body at home for a home funeral, or we will transport the body to our care facility. Expected death at home without hospice - Please call 911 and ask for the non-emergency line to report the death. A police officer will come to the house to help you, and they will notify the medical examiner/coroner. Inform the medical examiner/coroner that A Sacred Moment is your chosen funeral service. They will then notify us when A Sacred Moment can receive your loved one’s body into our care. Unexpected death at a facility - Let the nurse or staff know that you are choosing A Sacred Moment as your funeral service provider, and give them our phone number. A staff person will make the initial call. In this instance, the facility will have a say in how much time a family has to say goodbye, and may retain the body if the medical examiner needs to be involved. Unexpected death at home, adult family home, or other location - Call 911 and ask for the non-emergency line to report the death. A police officer will come to the location and notify the medical examiner/coroner. Depending on the circumstances, your loved one's body may be taken to the medical examiner/coroner's facility so the cause of death can be determined. You should inform the medical examiner/coroner that A Sacred Moment is your chosen funeral service. They will then notify us when A Sacred Moment can receive your loved one’s body into our care. Our staff will call you within 24 hours of notification, or on the first business day after the weekend or a holiday. We will set up an arrangement meeting and address any questions you may have. You may also call us at your convenience or Request an Appointment via our website. In our meeting, we will complete necessary paperwork, discuss the deceased’s wishes regarding cremation or burial, and make payment for services. Though an in-person meeting is highly recommended, the arrangements and paperwork can also be accomplished via phone, email, or our Online Cremation Form. When a loved one has died, it is important to notify various government agencies, banks, creditors, and credit reporting agencies. These notifications should be made promptly to reduce risk of identity theft. To expedite notification, you should make initial contact by telephone, followed by written verification. Many government and financial agencies will require the decedent’s social security number, a copy of their death certificate, and your appointment form from your county’s probate court if you are a personal representative/executor of the estate. Make sure to retain copies of all notices that you send. Download our checklist of possible agencies and businesses that should be notified of the death. Because each individual case is unique, the list may not be complete. Also, consult with your funeral director when you receive this list, as they may contact some of the agencies on your behalf. Social Security survivor’s benefits help ease the financial burdens that follow a worker’s death. Almost all children under age 18 will get monthly benefits if a working parent dies. Other family members may be eligible for benefits, too. Anyone who has worked and paid Social Security (FICA) taxes has been earning Social Security benefits for his or her family. You can apply for benefits by phone or by going to any Social Security office. Who Can Get Survivor’s Benefits? Surviving spouses age 60 or older (age 50 or older if disabled). Surviving spouses caring for the deceased’s child(ren) who are under age 16 or disabled. Divorced spouses age 60 or older, if married to the deceased 10 years or more. Surviving or divorced spouses age 50 or older if they are disabled and the disability started before or within 7 years of the worker’s death. An unmarried child of the deceased who is younger than age 18 (or up to age 19 if he or she is a full-time student in an elementary or high school); or age 18 or older with a disability that began before age 22. A stepchild, grandchild, step-grandchild or adopted child under certain circumstances. The deceased worker’s parents, age 62 or older, who were dependent on the deceased for at least half of their support. In addition to the monthly benefits for family members, a one-time payment of $255 can be paid to a spouse who was living with the worker at the time of death. If there is none, it can be paid to children who are eligible for benefits. Your checking and savings account information, if you want direct deposit for your benefits. You will need to submit original documents or copies certified by an issuing office. You can mail or bring them to the office. Social Security will make photocopies and return your original documents. If your loved one was receiving benefits, you need to contact the Social Security Administration to report the death. You must return the benefit received for the month of death or any later months. If benefits were paid by direct deposit, notify the bank or other financial institution. Request that any funds received for the month of death or later be returned to Social Security. If the benefits were paid by check, do not cash any checks received for the month in which the person dies or later. Return the checks to Social Security as soon as possible. For more information, write or visit any Social Security office, or call 1-800-772-1213. For the deaf or hard of hearing, call the TTY number, 1-800-325-0778. Specific questions can be answered weekdays from 7 a.m. to 7 p.m. You may also visit the Social Security website at www.socialsecurity.gov and click on the “Survivors” tab. Our nation provides free, dedicated burial places for veterans that may save you from the rising cost of burial in a commercial cemetery. If your loved one was an honorably discharged veteran, you are entitled to receive an American flag honoring their service to our country. 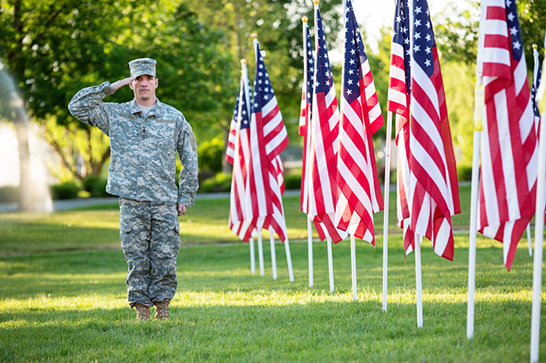 Provide A Sacred Moment with a copy of their military discharge paper (DD-214) and we’ll complete the necessary forms to obtain the flag for you. Burial benefits also include a free gravesite in any of the 131 national military cemeteries with available space. Benefits also include opening and closing of the grave, a vault or liner, perpetual care, a headstone or marker, a burial flag, and a Presidential Memorial Certificate—all at no cost to your family. Cremated remains are buried or inurned in national cemeteries in the same manner and with the same honors as casketed remains. For spouses and dependents, free benefits include burial with the veteran, perpetual care, and the spouse or dependents’ names and dates of birth and death inscribed on the veteran's headstone. Eligible spouses and dependents can receive these benefits even when they pre-decease the veteran. For more information on your particular benefits, contact the National Veterans Administration at toll-free 1-800-827-1000. For more information on our local national cemetery, Tahoma National Cemetery in Kent, WA, call 425-413-9614. And courtesy of Millstream Video Productions, you can experience our local Tahoma National Cemetery, complete with a ceremony for one veteran. This beautiful video captures the essence of a committal service at Tahoma, with the honor and color guard present to honor this veteran. When a loved one passes away, they often leave behind active online accounts on a variety of sites. It is important to close these accounts promptly. While getting the login credentials (as well as a list of which sites they have accounts with) in advance is the easiest way to do this, it is not the only way. For accounts that require payment, the easiest way to close the account is to close the credit card associated with it. For free accounts, you will often need to contact the company unless you have the login and password. Below is a list of the types of accounts families need to consider when taking care of their loved one’s digital afterlife. Email accounts: Gmail, Hotmail, Outlook, Yahoo, etc. Employment related accounts: LinkedIn, Monster, Dice, etc. Cloud storage accounts: Dropbox, Amazon Cloud, Google Cloud, Microsoft Cloud, etc. Entertainment accounts: Hulu, Netflix (close the associated credit card), YouTube, etc. Social media accounts: Facebook, Pinterest, Instagram, Twitter, YouTube, Reddit, etc. Furthermore, instead of simply closing an account, many social media sites also give families the option to have the account memorialized. View an example of a Facebook Memorial Page.